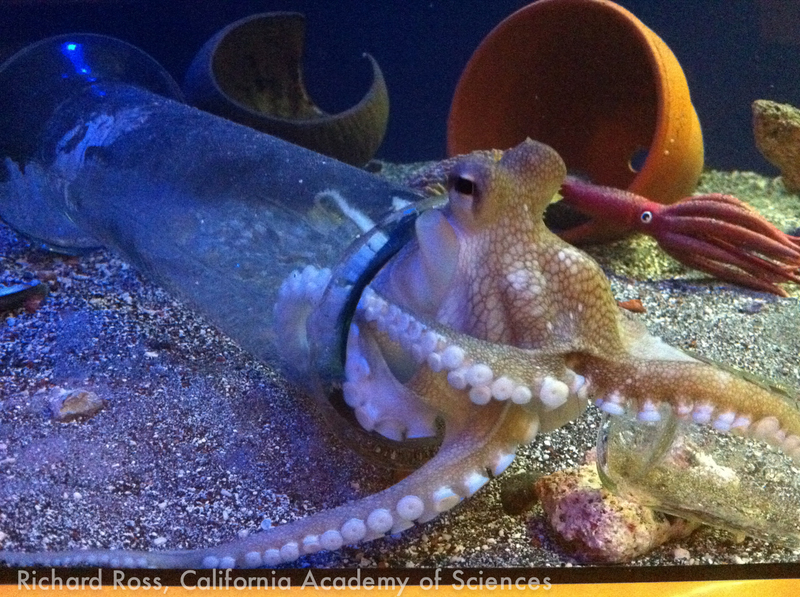 In the three months since we put an Amphiocotpus marginatus we collected in the Philippines on display at the Steinhart Aquarium, the octopus, named Fontenelle, has been engaging visitors to the aquarium. Fontenelle is in plain sight 95% of the time, often in interesting ‘lookout’ poses, playing with toy squid and toy octopus, or moving its den from jars to bottles to clay pots while keeping an eye on the people watching its antics. This species is one of the boldest cephalopods I have worked with, hunting with startling speed and latching onto my arm with that same unnerving speed anytime I have to put my hand in the tank. The growth rate on this animal is amazing, and since we decided not to be invasive with gathering data with this animal because we don’t want to stress it as we learn its husbandry needs (this may be the first time this species has been on public display) the two pictures below show the growth of the octopus in just a few months. 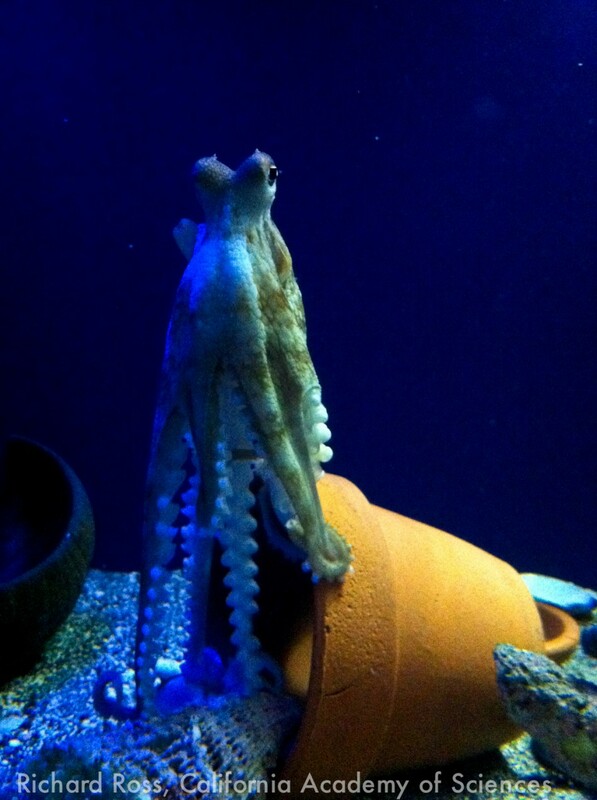 Even more exciting, Fontenelle has learned how to open jars by unscrewing the jars lid, one of the more captivating behaviors that octopus can learn (another being squirting me in the eye when I bring shrimp). The octopus has been opening jars for a couple of weeks already, and actually learned within a couple of days, but I have been unable to capture the opening on video. Either the jar is open before I get to the front of the tank, or the jar gets opened when I leave to attend to other animals. Today I set up the tripod before putting the jar in the tank and was able to catch the act on video. Its hard to see the actual unscrewing of the lid, and the final opening of the jar looks like the octopus simply pulls the lid up, but trust me, to get to that point the lid had to be unscrewed. Now, its time to start with other jars with more threads on the lid, tightening the lid much more, and finding other objects in which to hide food. 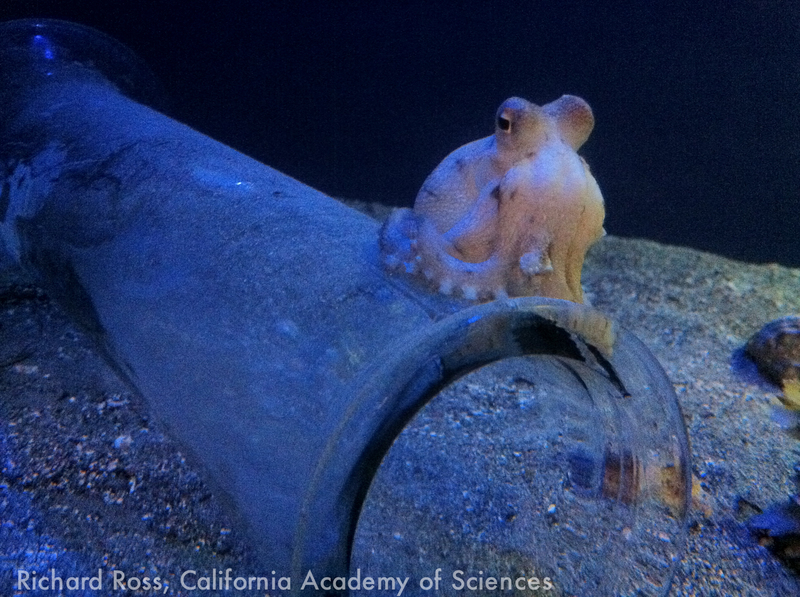 The same octopus in the same bottle on August 10, 2011. This little feller is soooo cute! As for the next step after opening jars, don’t leave it alone with the video camera too long, or you might find it shooting video of YOU. In fact, if you could come up with a way to provide it with an underwater camera, it would be very cool to see whether it can learn to manipulate what it sees. I’ve taken octopus off my dinner menu for good… but please don’t make me stop eating calamari. plllllleeeeease. I believe that your powers over the octopi are amazing. However, I feel that you do not comprehend what will happen if you continue to train the octopus. It can and will only lead to one thing, the doom of humanity. This is amamazing by the way.